This all seems quite straightforward, that is, until we try the calculation for a nonsignificant result, for example, for patients with low baseline stroke severity (NIHSS score between 0 and 5). The absolute risk reduction was 6.6% with a 95% confidence interval of –20.9% to 34.1%. Naively taking reciprocals gives a number needed to treat of about 15.2 and an apparent 95% confidence interval of –4.8 to 2.9, which does not seem to include 15.2! Clearly something's afoot. To understand the source of the confusion, note first that the lower limit of the confidence interval for the absolute risk reduction is negative, because the data do not rule out the possibility that tPA is actually harmful for this group of patients. The reciprocal of this lower limit is –4.8, or a “number needed to harm” of 4.8. Altman has suggested that a better description of positive and negative values of the number needed to treat would be the “number needed to treat for one additional patient to benefit (or be harmed),” or NNTB and NNTH respectively.3 The 95% confidence interval for the absolute risk reduction thus extends from a NNTH of 4.8 at one extreme to a NNTB of 2.9 at the other. To understand what such a confidence interval covers, imagine for a moment that the absolute risk reduction had only just been significant, with a confidence interval extending from slightly more than 0% to 34.1%. The confidence interval for the number needed to treat would now extend from 2.9 to something approaching infinity, denoted ∞. This would indicate that, according to the data, for one additional patient to benefit, a clinician would need to treat at least 2.9 patients (the reciprocal of 34.1%), but perhaps an extremely large number of patients. Thus, when a confidence interval for an absolute risk reduction overlaps zero, the corresponding confidence interval for the number needed to treat includes ∞. This explains the confusion in the case of the patients with low baseline stroke severity: the 95% confidence interval does, after all, contain the point estimate (Fig. 1). Following Altman's suggestion, the estimated number needed to treat and its confidence interval can be quoted as NNTB = 15.2 (95% confidence interval NNTH 4.8 to ∞ to NNTB 2.9). In other words, for this group of patients, it could be that, on average, treating as few as 3 patients with tPA would result in one additional patient benefiting. On the other hand, it could be that, on average, treating as few as 5 patients with tPA would result in one additional patient being harmed. It is important to remember that a nonsignificant number needed to treat will have a confidence interval with 2 parts, one allowing for the possibility that the treatment is actually harmful, and the other for the possibility that the treatment is beneficial. 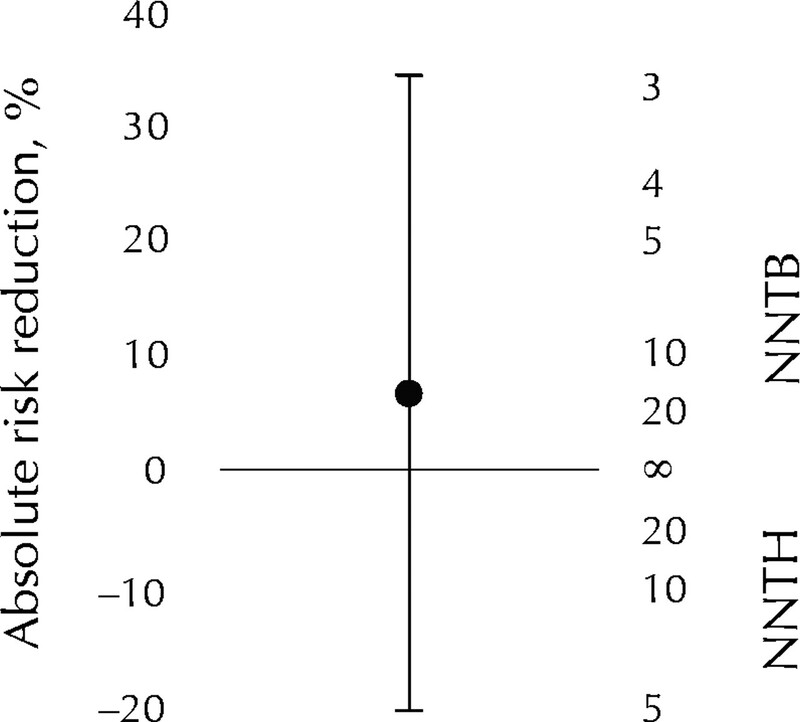 Published confidence intervals for the number needed to treat have sometimes included only one of these parts. CMAJ recommends that when authors express results in terms of the number needed to treat, point estimates for nonsignificant numbers needed to treat should be accompanied by confidence intervals using Altman's notation,3 as described in this commentary. Cook RJ, Sackett DL. The number needed to treat: a clinically useful measure of treatment effect [published erratum appears in BMJ 1995;310(6986): 1056]. BMJ 1995;310(6977):452-4. Altman DG. Confidence intervals for the number needed to treat. BMJ 1998; 317 (7168): 1309-12. Hutton JL. Number needed to treat: properties and problems. J R Stat Soc Ser A Stat Soc 2000;163:403-15. Lesaffre E, Pledger G. A note on the number needed to treat. Control Clin Trials 1999;20(5):439-47. Smeeth L, Haines A, Ebrahim S. Numbers needed to treat derived from meta-analyses — sometimes informative, usually misleading. BMJ 1999; 318 (7197): 1548-51. Bender R. Calculating confidence intervals for the number needed to treat. Control Clin Trials 2001;22(2):102-10.